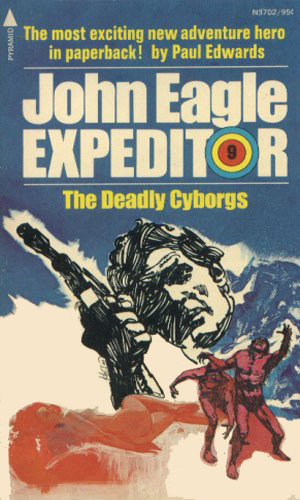 John Eagle is an agent for a unspecified U.S. intelligence agency. The son of a Scottish engineer father and a English mother, the man who would be known as John Eagle was born on an Apache reservation south of the Gila River. His parents had come there while his father worked on a road construction project. His mother died of blood loss during his delivery and his father, taking to drink in sorrow, died soon after in a construction accident. The young infant was left an orphan in the hands of his father's friend, an Apache warrior who took the responsibility of raising the child as his own son. The old man taught Eagle in the ways of the Indian tribe - taught him to run, stalk, sneak, and kill with great skill. When Eagle reached the age of maturity, he hungered for adventure and, seeing an ad for young men like himself, answered the odd classified and met Mr. Merlin. 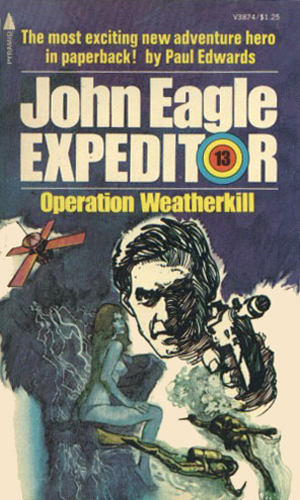 After triumphing in a test in which three men were set to stalk and eliminate him, Eagle was offered a contract by the mysterious Mr. Merlin. The terms of the contract were simple albeit strange. Eagle could not seek to discover what agency he worked for nor could he try to find out who Merlin really was. He was not to expect any comfort or aid from his government should be he caught while on assignment. In fact, he should not even admit to his citizenship! In exchange for accepting these conditions and undertaking a series of assignments, Eagle would receive a yearly salary of $100,000 tax-free. Should he live to see the end of his engagement, he would receive a tax-less one million dollars. The Mr. Merlin, almost more interesting a character than John Eagle, is the head of the secret intelligence agency who has had several 'lives'. First he was a much decorated hero of WWII where he eschewed the safety of the Pentagon for the behind the lines fighting. He lost the use of his legs as a result of his missions but earned considerable accolades. His next life was as a writer where he, under a pseudonym, wrote many best-selling mysteries. His third life was as a businessman where he exceeded even his own goals and became a billionaire many times over. Finally, with all his personal objectives met, he decided that it was time to pay back again for his success by creating an organization of Expeditors dedicated to keeping America strong. 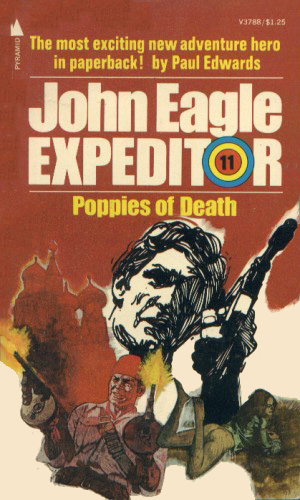 Thus far he had only one such member, John Eagle, but he wasn't finished yet. The series was created by the prolific produer Lyle Kenyon Engel who specialized in syndicate writing, namely creating a concept and then hiring young or hungry writers to churn out series under a house name. 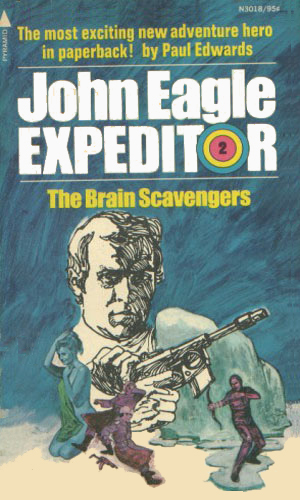 The first writer, and the one to set the tone for the series, was the highly capable Manning Lee Stokes who also wrote many Nick Carter Killmaster adventures. Something serious is being created in the wasteland of Mongolia and it is imperative that the U.S. learn what it is. 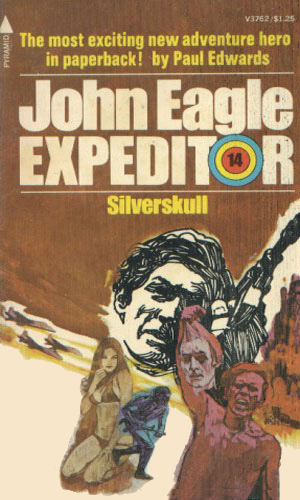 Newly recruited Expeditor John Eagle, fresh from a meeting with the President to make sure Mr. Merlin was legitimate, is selected to be the man to find out. From somewhere in Siberia comes an extremely weak SOS call and all indications have it originating from a location beneath the surface of the ice. Was there really a city in that desolate region? Might there be American scientists held hostage there forced to work on brain transfer technology? 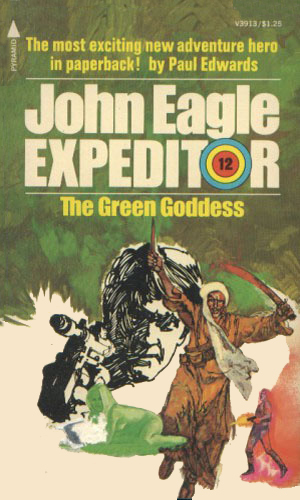 The jungles of Indochina are holding the man that John Eagle has been assigned to kill, safe behind a metal fortress. This impregnable facility houses a madman in possession of a large quantity of deadly gas, a man who has an urge for revenge against the world. The terrorists who killed the two American Foreign Service officers in Libya did more than anger the American establishment, led by the President himself. 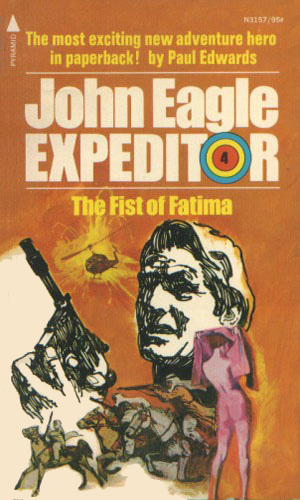 They incurred the wrath of John Eagle for one of the victims was a man to whom Eagle had been much beholden. The first question was what was on the island off Ecuador that brought so many rich old men looking for their youth. The next was why several ODESSA agents were suddenly dieing in a land they should have been safe. Those two questions are why Eagle is sent to that South American nation. 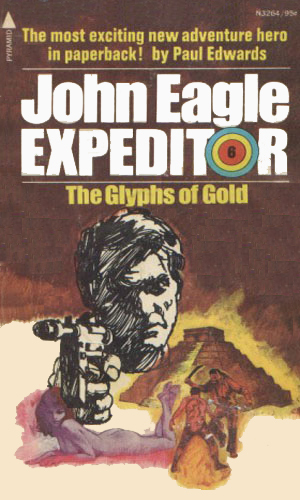 The rumors coming out of the Yucatan Peninsula were enough to get Merlin to dispatch John Eagle to check them out. The sighting of a city of gold, rumored for hundreds of years to exist, has supposedly been made. With Soviet and Chinese agents heading that way, the Americans had to have a presence, too. The beautiful young scientist had gone missing along the same time the weather seemed to have taken a strange turn. Droughts in normally wet lands and flooding in dry regions. Worst was the danger of the polar ice caps melting! 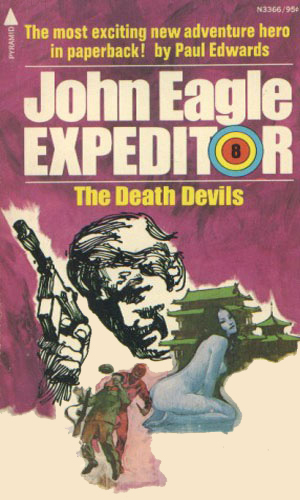 She had the enchanting name of 'Orchid Of Delight' but the word was strictly hands off as John Eagle is sent into --- to find and extract the beautiful Chinese woman. She was the key to finding more about an abominable program of genetic engineering creating the ultimate soldiers. 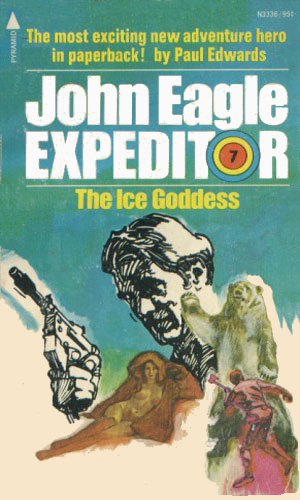 Was there really such a thing as the Abominable Snowman and did he truly prowl the frozen regions of the Himalayans? As crazy as that idea was, it was nothing to the rumors of creatures created by scientists for reasons that seem to defy understanding. John Eagle certainly could not believe it. 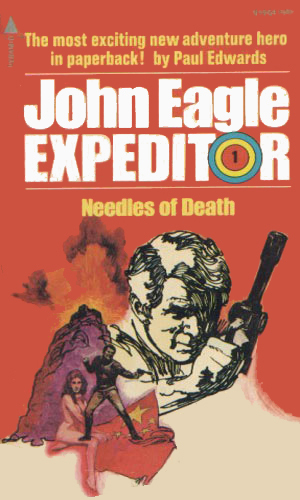 John Eagle's mission to northern India was to punish the people responsible for the death of a leading American weaponry expert. It was going to be next to impossible to reach the killers but that didn't bother Eagle nearly as much as meeting someone Eagle had already killed once! He had never been nervous before a mission until now but then he had never been asked to go behind the Iron Curtain before, either. Certainly he had never been sent to a mission site locked in a crate before. He was to steal a large Soviet cargo plane from Moscow and fly it out of the country. 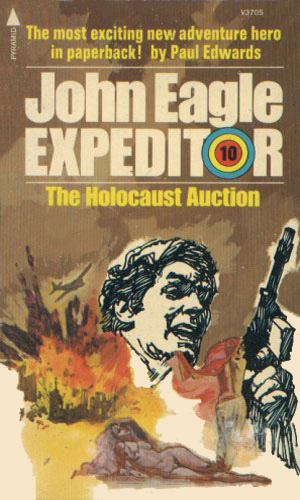 The denizens of the region of Afghanistan that Eagle was in seemed to have a monopoly on violence but that wasn't the reason he had been sent to that desolate region of the world. His mission was to find out the truth behind the rumors of a new alloy that would create instant electricity. The American government was told that the region was going to be flooded. It wasn't the weathermen who predicted the deluge but a mysterious message that foretold it. The message also indicated that unless the government handed over a ton of gold, the floods would escalate greatly. Sir Rodney Hamilton had a plot to take over and control all the oil from the South American nation of Venezuela and he was well on his way to making it happen. 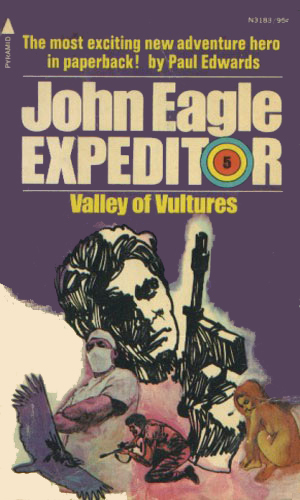 That is what John Eagle is sent to prevent but even the Expeditor could not know that an ace in the hole for the villain was a mass of piranha starving for food. 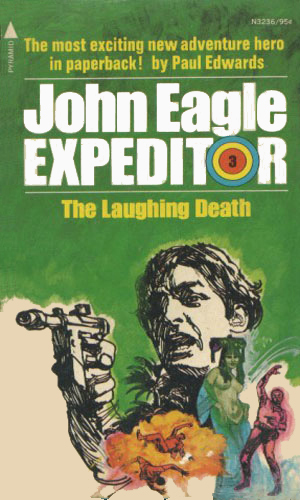 If you want straight action, some humor, and great adventure, don't overlook the Expeditor. Despite the rather goofy name, the stories are quite enjoyable and worthy of a chance. Don't expect great drama or characterization but for a fast, fun read, it is good. This is especially true for this series since it was a syndicate-generated one which meant that there was little room for character building outside that which was established at the beginning and none whatsoever for character advancement as it was vital to keep things even so one book didn't conflict with a previous one. So, enjoy them for gun-popping, fist-flying, bodice-ripping excitement and don't expect any more.